← Councillor Rosa Battle says hundreds consulted on Green Infrastructure. Actual number – fewer than 50. This paper contributes to recent work that attempts to overcome the tendency of existing evolutionary work to view path creation as a primarily regional or territorialised process that underplays the role of extra-regional actors, networks and institutional contexts. While notions of place dependence rightly direct attention to local conditions of path creation, we recognise that path creation is also enabled or constrained by multi-actor and multi-scalar settings and power relations. In response, this paper develops a broader evolutionary perspective on path creation in regions which stresses the dynamic interplay between three sets of factors: regional assets and actors; national institutional environments and policy regimes; and Global Production Networks (GPNs). 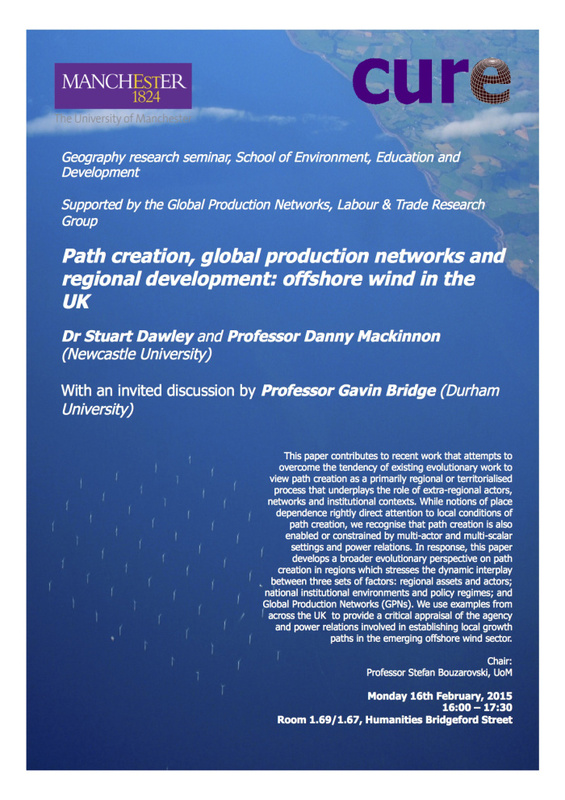 We use examples from across the UK to provide a critical appraisal of the agency and power relations involved in establishing local growth paths in the emerging offshore wind sector. This entry was posted in academia, Energy, Upcoming Events. Bookmark the permalink.